A Boston Globe investigation has uncovered a dangerous hospital trend that could put patients at risk. 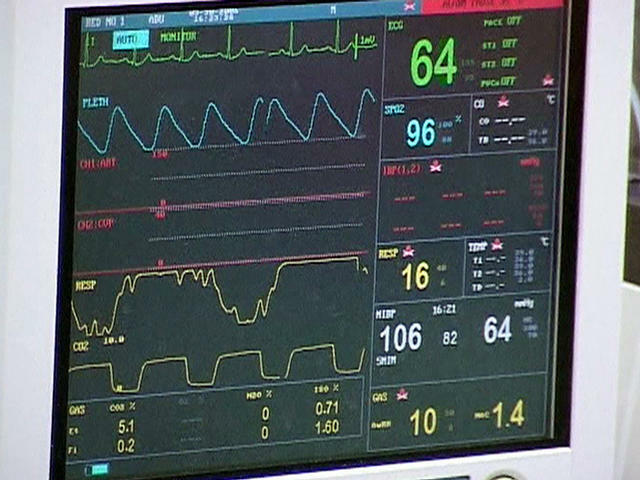 The newspaper says more than 200 deaths nationwide over the past five years have been associated with problems with patient monitor alarms. In many of those cases, it's believed something called "alarm fatigue" is to blame. "Alarm fatigue" refers to the response - or lack of it - of nurses to more than a dozen types of alarms that can sound hundreds of times a day - and many of those calls are false alarms. The result? Nurses become desensitized to distress calls, and don't react with enough urgency - or at all - when a real emergency happens. Liz Kowalczyk, the reporter who broke the story, told CBS News what often happens is, nurses don't hear alarms, ignore them, or silence them without responding to the patient. She told co-anchor Russ Mitchell, "We wanted to see if we could find out how many patients are actually harmed by alarm fatigue. So we analyzed reports that hospitals made to the U.S. Food and Drug Administration over the last five years, as well as to two states that track these types of incidents, Massachusetts and Pennsylvania. We also talked to dozens of nurses, doctors who oversee patient safety in hospitals, monitor makers, FDA officials, and also families." Kowalczyk pointed out that, "Exact data is hard to come by. But many people who work in health care think (alarm fatigue is) getting worse. ECRI (the ECRI Institute), the nonprofit organization that helped us research the FDA reports, says hospitals are using many, many more devices that sound alarms. As a result, more patients are hooked up to monitors. And there are many more alarms going off." She says she doesn't think "hospitals that have had patient deaths were surprised" by the investigation's findings. "Many of them are working to try improve their monitoring. But, nurses and doctors will tell you that the manufacturers also need to improve the technology, and reduce the huge number of false alarms, which play a major role in desensitizing nurses." CBS News Medical Correspondent Dr. Jennifer Ashton says there are things patients and their families can do to try to minimize the risk of harm from alarm fatigue - beginning with asking doctors and nurses what each monitor being used is for. "This is possibly an issue here where technology designed to make things safer and better may actually be doing more harm than good," Ashton observed. "These monitors detect heart rate, respiratory or breathing rate, your blood pressure and the amount of oxygen in your blood. So, if you or someone you know is put on one of these monitors, the first question you want to ask is, 'What is this actually for? Is it specifically to look at their heart rate or respiratory rate?' Because that can then help you determine, really, what will go on if one of them goes off by mistake. "The next question you really want to ask is, is it necessary? These are not just used in the Intensive Care Unit or ICU settings anymore. They're also used in the emergency room. They're used even on some general patient floors. So you want to ask, 'Is this necessary?' The answer will either be, 'This is a hospital policy, every single patient gets one,' or, specifically, 'You or your loved one is having a problem with their heart; that's why we have them on the monitor." Whose job is it to track monitors in hospitals? And whom should you ask? "Generally," Ashton says, "you want to find the nurse. Remember - the nurses are not just following these monitors: They're giving medications, they're assisting doctors in procedures, changing dressings. They are incredibly busy. They often have many patients to care for. Nurses that I've spoken to find that it does kind of set up a 'cry wolf' scenario where these monitors go off, sometimes every 90 seconds. Just on one patient. And they're constantly silencing them, taking them away from giving good patient care."